You can find and play a song ordered by artist name rather than by playlist on your iPhone. Tap the Artists icon at the bottom of the screen and an alphabetical list of artists appears. If the list is longer than one screen (which it probably is), you can, of course, flick upward to scroll down or flick downward to scroll up. But you have easier ways to find an artist. For example, at the top of the screen, above the first artist’s name, you see a search field. Tap it and type the name of the artist you want to find. Now tap the Search button to see a list of all matching artists. Another way to find an artist is to tap one of the little letters on the right side of the screen, to jump directly to artists whose names start with that letter. In this figure, for example, that letter is B. Notice that a magnifying glass appears above the A on the right side of the screen. Tap the magnifying glass to jump directly to the search field. As you can see, those letters are extremely small, so unless you have tiny fingers, you may have to settle for a letter close to the one you want or else tap several times until you select the correct one. Using a stylus instead of your finger may help. 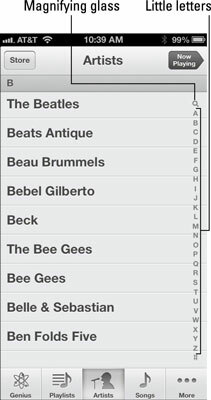 If you have songs from more than one album by an artist in your music library: A list of albums appears. Tap an album to see a list of the songs it contains. 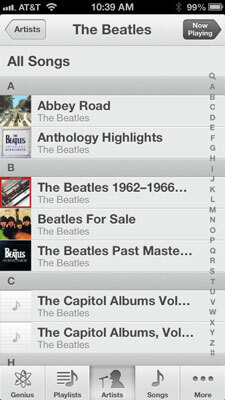 Or tap the first item in the list of albums — All Songs — to see a list of all songs on all albums by that artist. If all songs in your music library by that artist are on the same album or aren’t associated with a specific album: A list of all songs by that artist appears. Either way, just tap a song and it begins to play.